The Redhawks took a blow in conference play this past weekend, losing their series to Austin Peay two games to one. Southeast fell 4-2 and 10-2 to the Governors and picked up a lone 7-4 victory. Southeast took the lead and kept it in the eighth inning as senior third baseman Alex Nielsen and freshman catcher Andrew Keck once again drove in runs to finish off the game with a 7-4 Redhawks victory. In the game played on March 23, Austin Peay took a 3-0 lead through the fifth inning. 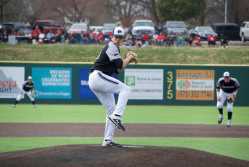 Starting pitcher Noah Niznik prepares to deliver off the mound on March 23 against Austin Peay at Capaha Field. In the bottom of the fifth, Southeast scored its first run as Keck hit a home run to left field, the first of his career. Junior center fielder Danny Wright and Nielsen both had RBIs in the next inning, tying up the game 3-3. Austin Peay regained the lead in a sacrifice groundout by senior catcher David Martinez. In the top of the seventh when senior shortstop Garrett Kueber scored on a groundout to put the Governors up 4-3. 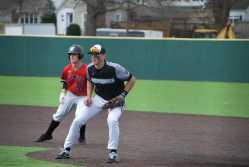 Freshman Turner Fritts covers his ground at first base on March 23 against Austin Peay on Capaha Field. In Sunday’s game, APSU scored nine of its 10 runs in the second inning, causing an early pitching change for the Redhawks. Senior pitcher Dan Bergtholdt yielded five runs in the second. Southeast used a total of four pitchers during Sunday’s 10-2 loss to Austin Peay’s two. Junior Brandon Vial of the Governors gained the pitching victory. Vial struck out five batters, walked three and allowed two runs on five hits in his five innings of pitching. Governors redshirt-junior right fielder Parker Phillips and senior catcher David Martinez did most of the damage in this game. Martinez hit two home runs in the second inning and Phillips smashed a grand slam to right field in the second inning and a solo home run in the ninth. The Governors outhit the Redhawks 13-6 and the Redhawks only managed to score on two of those. In the bottom of the fifth inning, Wright had a RBI single and sophomore shortstop Tyler Wilber doubled home a run. The first game of the series was decided early as Austin Peay put up four runs in the second inning enroute to a 4-2 win over the Redhawks. The runs came on three RBI singles and an error. 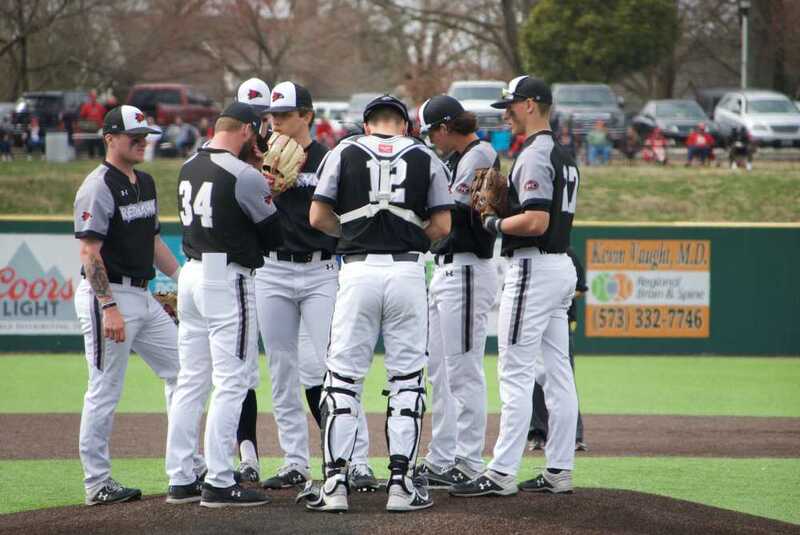 Wilber drove home a run in the fourth inning and junior second baseman Connor Basler drove in RBIs later in the fifth inning, providing SEMO with its only two scores of the day. Southeast starting pitcher Dylan Dodd gave up four runs on seven hits over six innings and struck out six batters with no walks in the loss. Austin Peay pitcher Josh Rye picked up the win, allowing two runs on five hits, striking out three and walking three in five innings. Southeast is currently sitting at 13-11 overall, 3-6 in Ohio Valley Conference play.